 This autobiography vividly describes the author's loss and rediscovery of his cultural and religious heritage. Burkina Faso was still a French colony when SomÇ was born in 1956. At the age of four he was taken from his village by the local Jesuit missionary, who had persuaded his father that he should study for the priesthood. SomÇ begins his account with a description of his early years in the village and his relationship with his grandfather, a powerful elder and medicine man. In the middle section, he deals with the painful years at school and junior seminary. He and his companions were forbidden all reference to their native language and customs, including use of their tribal names, and were victimized by incidents of sadistic cruelty inflicted by the priests and their native assistants. When he was 20 SomÇ was involved in a fight with a priest, after which he fled the seminary and returned to his village. There the elders decided that he should undergo the men's initiation ceremony, normally carried out at puberty. The book's final third describes this extraordinary six-week experience, a dramatic encounter with the psyche that involved, among other things, being buried alive. (Several young men apparently died during the ceremony.) Afterwards the village elders divined that SomÇ should return to offer whites the wisdom and healing they need. 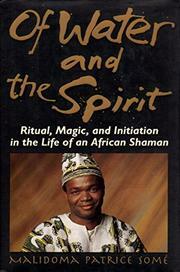 To read this book is to be immersed in a fascinating world of spirits, symbolism, and magic, yet the author leaves some unresolved contradictions. His claim, for example, that the Jesuits ``kidnapped'' him is not borne out by his text, and he does not seem to have really lived the harsh village life that he eulogizes. Nor does SomÇ address the crucial question of whether and how traditional ways can flourish in anything but the tribal context. Rservations aside, a beautifully written and personal story that grapples with questions of identity and tradition that affect us all.